I am weird when it comes to breakfast foods. Getting up so early for work every day, and usually hitting the snooze button numerous times until I have no time left to do anything but get ready, has trained my body to pretend breakfast isn’t a thing. Believe me, it’s not that I’m not hungry in the morning, I just don’t really have any grab and go kinds of food in the house, except sometimes granola bars. And when you’ve eaten as many granola bars as I have over the years, you get to a point where you’d rather be hungry that eat another one. But on days off and vacation? You can bet that I’m in the kitchen whipping up a hearty, filling, oftentimes overly sweet breakfast. 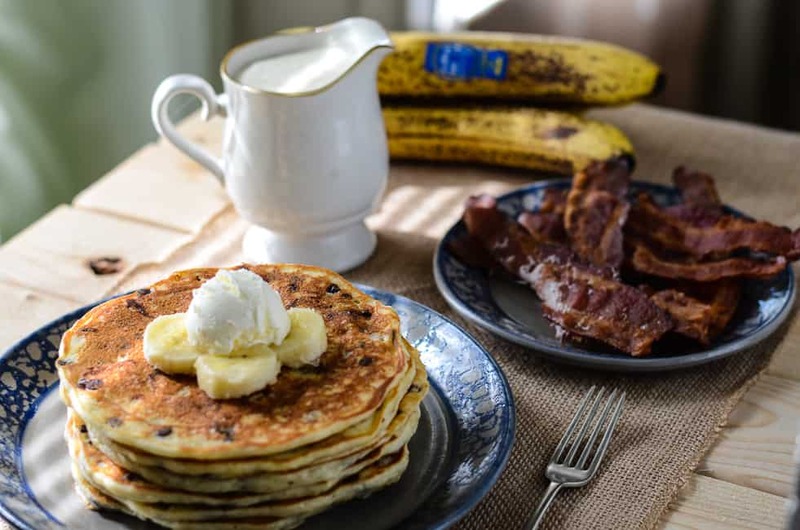 These Banana Chocolate Chip Pancakes were my favorite morning creation on our recent vacation, and the Cream Cheese Syrup is so good, I’ve already used it on other things! This recipe actually came about thanks to the Cooking Lab Recipe Contest that Chiquita has been holding for the last month or so. I entered weeks #3 and #4, and when week #5’s ingredients were revealed, I gave it a shot. I decided the end result wouldn’t be original enough for them, so I withheld entering and saved them for you! I have definitely seen a good amount of extremely creative pancakes on the internet, and banana chocolate chip pancakes are nothing new. These happen to contain buttermilk, sour cream, and 2 kinds of sugar, and they are super fluffy and moist. Plus, my chocolate chip pancakes are smothered in Cream Cheese Syrup. A seriously simple yet amazing way to top them. It would be wonderful on ANY pancakes. Waffles. French toast. Crepes. You know, whatever is available. 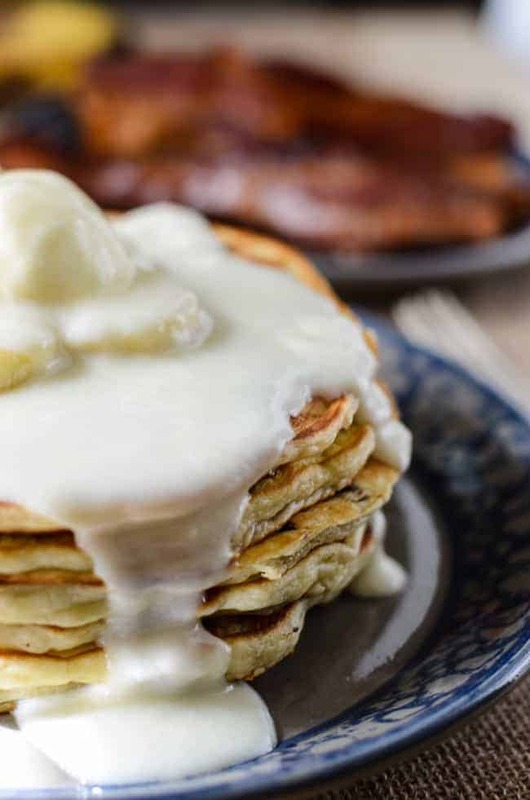 Even as a syrup, it’s just so wonderfully thick and creamy. I adore cream cheese icing (I top about 80% of my cupcake recipes with it! ), and I had to find a way to work it into breakfast somehow. It reminds me of a slightly sweeter and runnier version of the little tub of icing you get in a can of Pillsbury Cinnamon Rolls. Watch out when I’m making those bad boys. Usually, more of it ends up in my mouth than on to the cinnamon rolls. 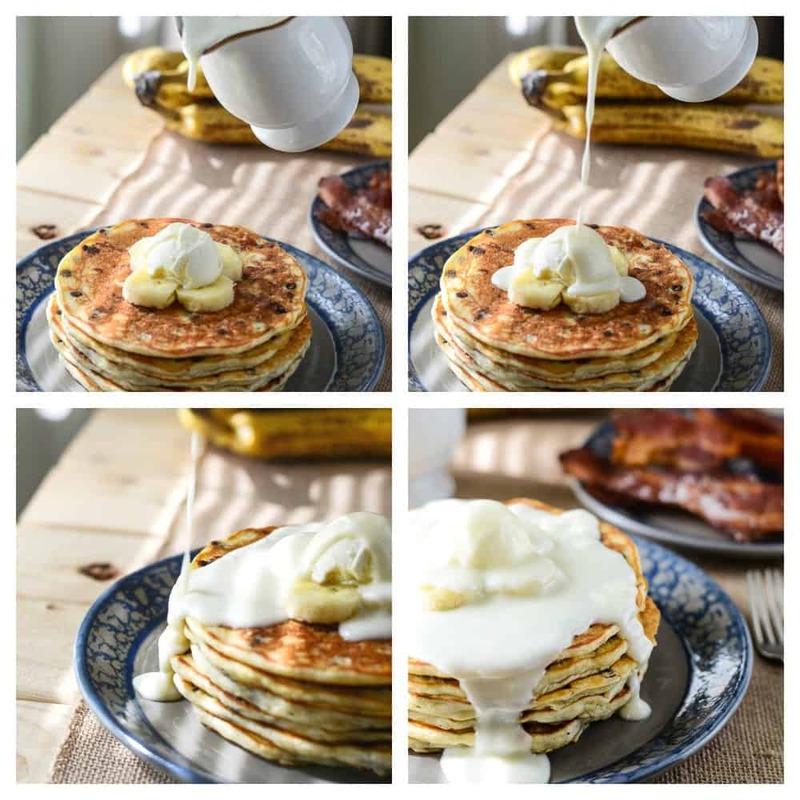 For Banana Chocolate Chip Pancakes…. Love carb-loaded pancakes? 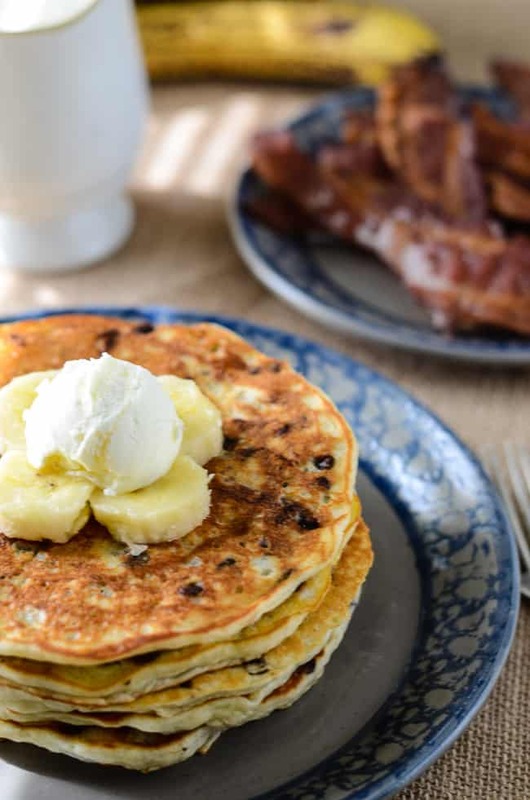 You’re going to adore these other breakfast recipes! 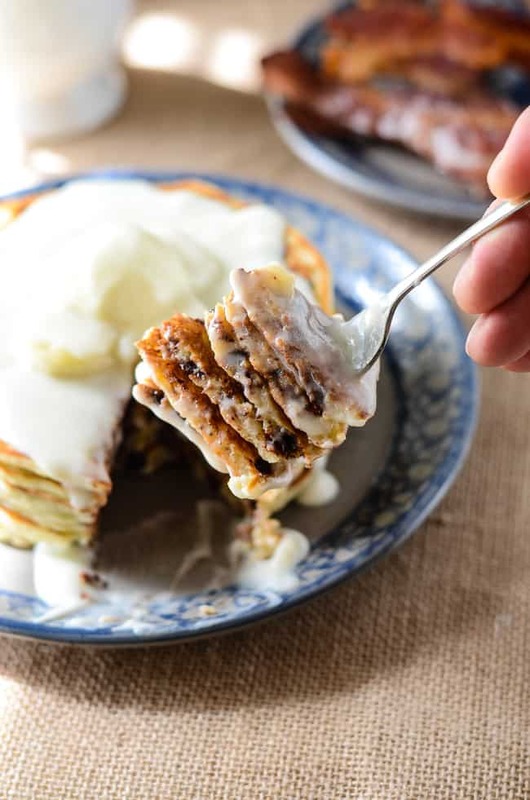 Banana Chocolate Chip Pancakes: perfectly light and fluffy banana pancakes, studded with handfuls of chocolate chips, and topped with an ooey-gooey cream cheese "syrup!" In a small bowl, blend cream cheese and butter with a hand mixer until fluffy, about 2 minutes. Add powdered sugar, vanilla, and milk, beating until well combined and smooth. You may need to add more milk, depending on how "syrupy" you want your finished product. *You may need to heat this in the microwave for 10 seconds or so before pouring to return it to a pourable state. Heat a griddle to 325 degrees F.
In a large bowl, whisk together flour, sugar, baking powder, baking soda, and salt. Make a shallow well in the center of the flour mixture. In a separate bowl, combine mashed bananas, egg, brown sugar, butter, buttermilk, milk, and sour cream, mixing until well combined. Combine wet ingredients with flour mixture, stirring about 5-6 strokes. Add chocolate chips and stir gently until just combined. Don't over mix! Pour 1/4-1/3 cup of batter per pancake on to the griddle. When the top looks slightly dry and bubbles have appeared (about 3-4 minutes depending on your griddle), flip the pancakes and cook the other side another 2-3 minutes. 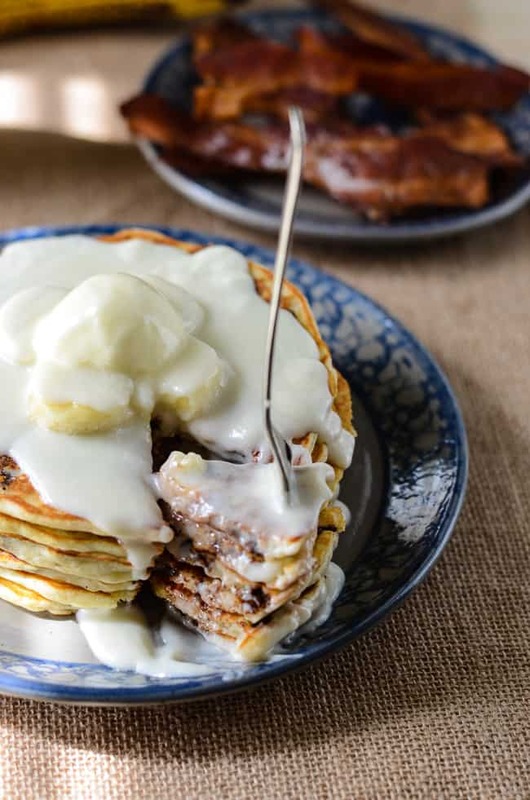 Stack the pancakes, top them with butter and banana slices, and your desired amount of Cream Cheese Syrup. Holy crap. I need these in my life, like, yesterday. Oh my goodness this looks fantastic and your pictures are amazing! This looks so yummy.. I am going to have to try the cream cheese is definitely something I like to add to holiday pancakes. These look amazing!! Honestly, you had me a cream cheese syrup!! These looks absolutely amazing! I need to try this recipe ASAP!!! Thank you, Holly! Let me know how they turn out. These are going on the breakfast rotation, STAT! Thanks for the recipe card! These look so good! And BTW I’m mad at you because you didn’t save me any :'( Just kidding. Those pumpkin, apple and pecan ones that I got to try made up for it! This looks mouth watering delicious right now! I pinned this to try later because I know my family will enjoy this one the weekends! Thank you for the pin! I hope everyone loves them as much as I did! These look fantastic! I love finding different things to top pancakes with instead of tired old maple syrup. Right now I am loving a pumpkin pancake recipe we have been using. I don’t eat breakfast either so I only get to do this fun stuff Sunday mornings. Since I try to eat a grain-free and egg free diet, my favorite pancakes are made with chickpea flour. 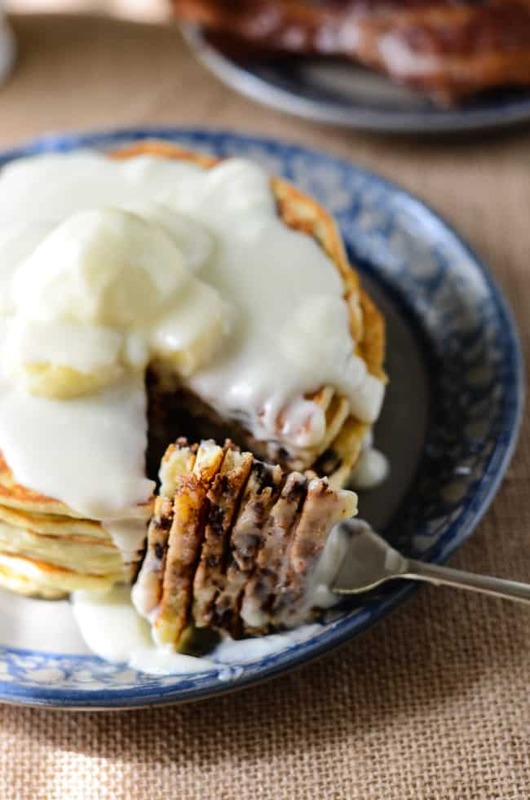 These pancakes looking yummy and the cheesecake syrup sounds amazing. Oooh, chickpea flour! That sounds like it makes for interesting food. I’ll have to look into that! I’m salivating, these look amazing! Just like you, I often skip breakfast, or grab some PB crackers or something to go. These are worth taking the time for!! 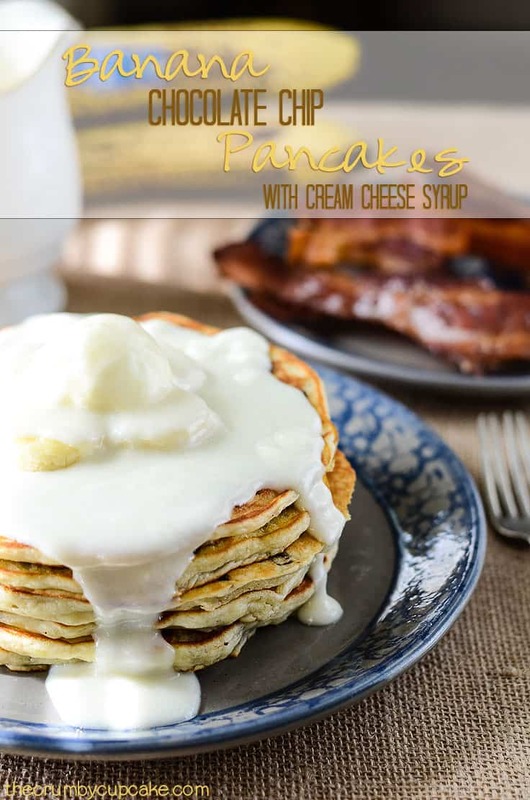 I love how you substituted a cream cheese syrup for maple. I imagine it going so much better with the banana/chocolate chips.